What if Your Best Book Comes Last in the Series? What if you’re writing a series and it looks like the last book in the series will be more exciting than the first? Is that bad? I’m working on the first of what I plan to be a series of fiction novels. I’ve used the Snowflake method to craft outlines for three novels so far. My question is: what to do if I think the most exciting story is in the third book? It’s kind of like George Lucas debuting the Star Wars series with Episode 4, because he wanted audiences to meet Darth Vader as a fully formed villain, rather than the conflicted boy he was in Episodes 1-3. Should I skip ahead to write book 3, which will probably change parts of books 1 & 2, or stay patient and keep building? Randy sez: Just to make sure everybody’s on the same page, Will is referring to my wildly popular Snowflake Method of writing a novel. He’s used it to plan out a whole series, which shows some serious dedication to planning. Kudos, Will, for mapping out three whole novels in advance! That’s hard work, and it’ll pay off for you as soon as you start writing. It’s hard to give advice when I haven’t seen your Snowflake documents and don’t know all the details of your story. Now let’s look at those two cases. What if Book 1 is Bad? If Book 1 in your series is bad, then nobody is going to read Book 2 except your mother, and even she won’t read Book 3. If that’s the case, then you need to rethink your series and figure out how to make Books 1 and 2 better. It sounds like you’re still in the planning stage and you haven’t written any of them yet, so there’s no high cost to revising your plans. It’s much quicker and easier to revise a Snowflake document than a four-hundred-page manuscript! What if Book 1 is Solid? If Book 1 in your series is in good shape, and the only problem is that it’s not as good as Book 3, then that’s a wonderful problem to have. Remember the Harry Potter series? Book 1 was very good. Book 2 was even better. Book 3 was way better. Book 4 was massively better. And Book 7 was the best of all. That makes for a wonderful reader experience. Every book is better than the one before. I can’t see a downside in this case. By all means, think about how you might make Books 1 and 2 stronger. I’m a big fan of always writing the absolute best work you can write today. But once you’re done with today’s work, let it go. Then try to do better tomorrow. I’ve tried to do that in my own novels. (And in my blog posts. And in my e-zine.) I may not succeed in always doing better with every effort. That’s not under my control. The only thing under my control is whether I do my best work on any given day. I don’t think it’s a good idea to start with Book 3 and then go back and do Books 1 and 2. Since Will mentioned the Star Wars series, I’ll just say that I liked Episodes 4, 5, and 6, and I thought they made a complete series. Having seen those first, I found that Episodes 1, 2, and 3 didn’t work for me, because I was comparing them to 4, 5, and 6. Can you use the Snowflake Method to write a series of novels? Or does it only make sense to use it for each individual book in the series? Can the Snowflake method be extended to tie together a series of philosophical message/romantic literature novels? My motivation: Self-interest to save me and those that I care about from the evils of Gov Goliath and coming economic, political and social collapse. My Goal: Write a series of romantic literature novels starting with a controversial break-through that sells in sufficient numbers to be an efficient education tool, inspires readers to yearn for more and prompts readers to action to save themselves and those they care about by replacing compulsory territorial majority rule government with non-compulsory, non-territorial spontaneous order voluntary free market societies based on the actionable Golden Rule social contract and the non-aggression principle (NAP) that prohibits the initiation for force except in self-defense. Target Audience: 20-year-old’s who are inspired by Ayn Rand’s “Atlas Shrugged” and enjoy romantic literature like “The Godfather” but yearn for more. Word-of-mouth Audience: Same as above except those of any age. Comment: The Snowflake method looks like the tool of choice for the individual novels in the series but the question is: Can the Snowflake method be used to tie the individual novels together into a coherent series that continues to build suspense by leveraging the backstory in previous sequels. Randy sez: This is a good question, David, and people have asked me this several times in the past. I’ve also asked myself the question, because I’m currently working on a series. For those just joining us on this blog, a little context might be helpful: What is the Snowflake Method? The Snowflake Method is a series of steps I created years ago for helping set up a roadmap for a novel. The purpose of the Snowflake Method is to make it easier to write the first draft of the novel. Some of the steps ask you to develop the plot; some ask you to develop the characters. Many people around the world are using the Snowflake Method, and my article on it has been viewed over 5 million times, and has been translated into several languages. 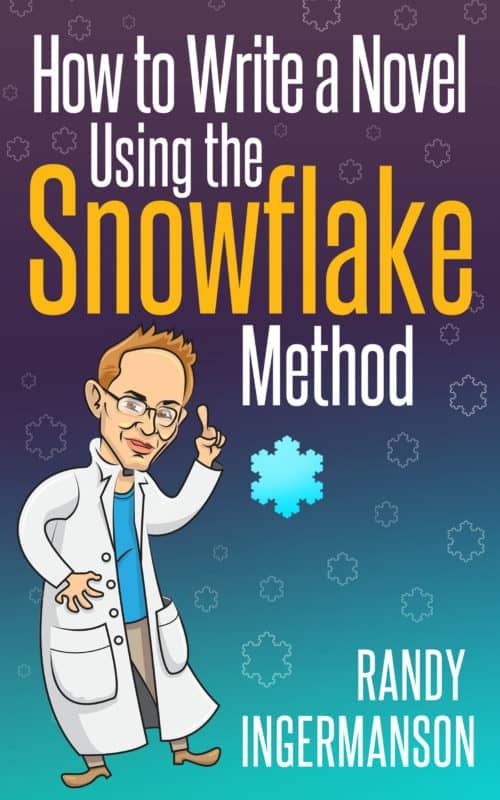 For those who want to know more, I have a book out on the Snowflake Method, written as a fairy-tale business parable. It should be clear that the work you put into character development using the Snowflake Method will be useful for all the books in your series. Since a big part of your character development is finding the backstory of each character, this won’t change from book to book. But what about the plotting work? Are there elements of the Snowflake Method that you can use for the series? And will that save you work when plotting each book? Yes, you can use some elements of the Snowflake Method to help you define the overall plot of the series, as long as the series actually has an overall plot. I’d say the main element you’ll want to use is the Three-Act Structure. A series can often be divided into this structure, at least approximately. I think you can argue that the Harry Potter series and the Hunger Games series both fit the structure well. I suspect that the Twilight series also roughly fits the three-act structure, although it’s been a while since I read it, so I’ve forgotten most of the details. Note that some series don’t really have an overall plot—they’re just a sequence of books without much structure. Lee Child’s Jack Reacher series is an example of a set of novels with no overall plot. Likewise Tom Clancy’s Jack Ryan series has no macro structure. This is neither right nor wrong. It’s just a decision on how you want the series to be, and authors typically make this decision early. But no, it won’t save you any work on plot development for the series, because each book needs to stand alone as its own story. This means that the plotting aspects of the Snowflake Method need to be worked through for each book. And then you still have to work through the overall story arc for the series, which adds more work. But the main extra work you have to do is to define a Three-Act Structure, and this isn’t an unreasonable burden. One final comment, David: You’re writing a series of message novels. These can do fantastically well in the market, if they’re done well. Ayn Rand’s novels were all message novels. So were the Left Behind series by Jerry Jenkins and Tim LaHaye. So are Dan Brown’s recent works. William Paul Young’s book The Shack was a message novel. And it’s easy to find more examples of megahit message novels. But it’s also easy to find examples of message novels that are poorly done, where the message overwhelms the story. Anyone who’s ever taught at a writing conference has seen plenty of these, and they’ll tell you that when a message novel is bad, it’s awful. So be wary here. Make sure that your story is strong and that the message serves the story. When the story is forced to serve the message, things don’t work out so well. Work hard, and good luck!